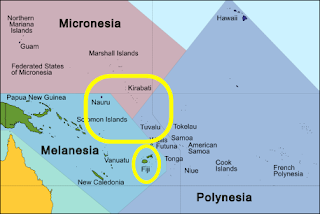 Fiji rules supreme in the South Pacific. It has the most people (approaching one million), the largest land mass, and the most modern infrastructure. 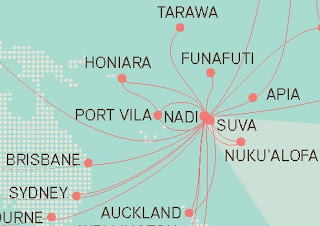 Fiji Airlines has cleverly cornered the market as the hub for the western South Pacific region. 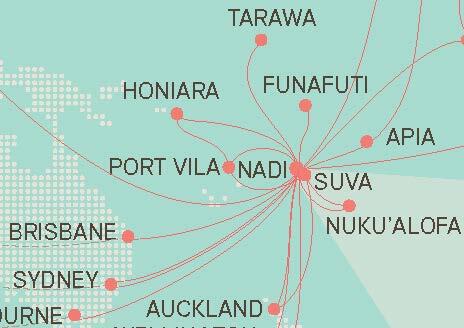 So my July island hopping will all be via layovers in Fiji. And Fiji Airlines looks like a surprisingly modern operation with some fine new planes, and it turned out to be fairly although not entirely reliable. 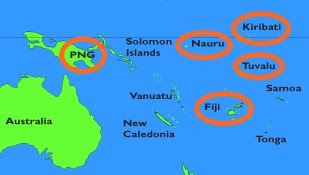 ‣ Papua New Guinea (PNG). While I'm spending four layover nights and two afternoons in Fiji, I'm not going beyond beyond the airport vicinity. I hope to return next summer and see it more of Fiji. another passenger in Fiji awaiting the flight to Tuvalu.